I said, “What if I make it instead?” Ask and ye shall receive! I must say, though, that it wasn’t hard at all and well worth the effort. With the soaking time needed, we didn’t eat white bean hummus that night, but it was absolutely great the next day! This white bean dish has every kind of flexibility. You can serve it as a dip for cucumbers or carrots, or present it as traditional hummus with pita triangles or crackers. The white beans can provide a lovely vegan protein at the center of a veggie plate. And it’s a perfect spread as the base of a veggie sandwich—topped, say, with avocado, cucumber, and sprouts. You can spice it up with paprika if you wish or cool it down with cilantro and mint. Serve it room temperature in the summer or heat it in the winter. Any way you do this, the flavors will be compelling. 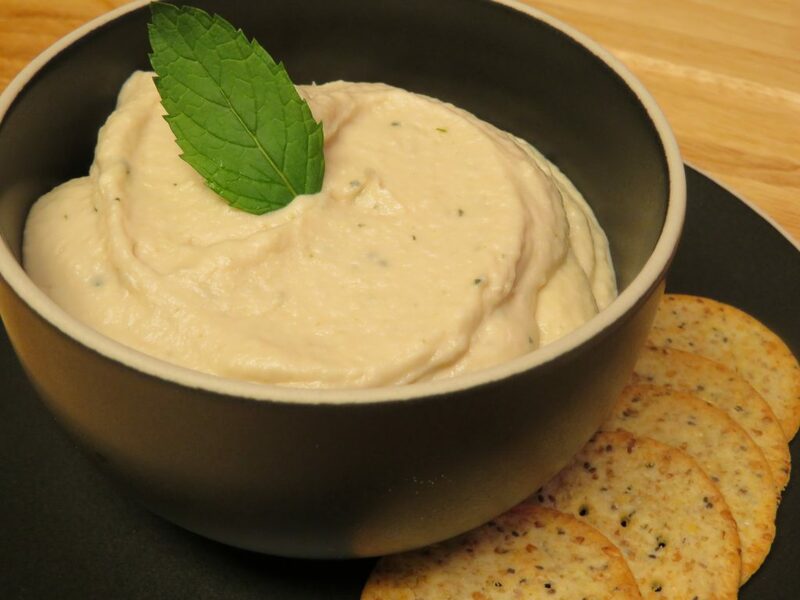 Tom was planning to make this white bean hummus with sage, but I was in a Mediterranean mood and infused it with fresh basil and mint instead. You can also add as much or as little seasoning as you like, along with olive oil, garlic, and lime (or lemon) juice to taste. The dish is utterly adaptable, so let this recipe be your starting place and let your taste buds settle the rest. Some readers may ask, why no tahini? The main answer to that question is that tahini is made from sesame, which is for many a major allergen. I’m not allergic to sesame myself, but I feel best when I don’t eat it—regrettably, because I do love the taste of tahini! Also, sesame (and, therefore, tahini) is heating, and I like to avoid heating foods during the hottest months of the year. There is garlic in this recipe, to add to the flavor and to help make the beans more digestible, and this is enough heat for this dish during July and August in most parts of the country! Finally, I know that the Instant Pot recipes say you don’t have to soak the beans first, and they’re right. You don’t have to, but they will be a lot easier to digest. A word to the wise! Try this white bean dish just any which way all year round—and especially right now, when it’s perfect to avoid eating foods hot off the stove. Just for the record: next time, I’m making white bean hummus with sage! 1. Soak the beans for 6 to 8 hours before cooking. Cook them in a pressure cooker or Instant Pot with water according to the pot’s directions. Or cook them in a stainless steel pot with water for about an hour, until completely tender. 2. Once the beans are tender, strain them, saving about a cup of the cooking water. Let the beans cool in the strainer. To speed up the cooling process, you can place the strainer in a stainless steel bowl and move the beans to the freezer for about 10 minutes. 3. Transfer the cooled beans to a food processor or blender. Add ¼ cup of the saved cooking water, the chopped garlic, and 2 tablespoons of oil. Process until smooth. Add the remaining ingredients, adjusting for taste. Add additional cooking water until the spread is the preferred texture: silky for hummus and slightly stiffer for a sandwich spread. Use lime instead of lemon. Less garlic. Use the cooling herbs.